Home Blog Cyprus: Sun, Cycling and Stumps, Part 2. So, quick recap: Dad, Imogen, Borje and I are heading to hospital in the Mighty Foxy. I have the stump of a bush stuck in my upper right leg and am concentrating very hard on keeping the muscle fully relaxed whilst not falling off the seats which I am lying across. Easier said than done. I was given gas and air, had several injections, took off my jewellery, had my leg bandaged around the stump and was attached to a multitude of wires and tubes. And then, in a mystery yet unsolved, I was taken for an x-ray… of my chest. Eventually I was wheeled up to a ward and waited for a slot in theatre. I had realised pretty early on that I was going to have to have surgery so I had resisted the temptation to eat or drink and worked out when I had last ingested anything. A quarter past eleven, it was. I’m fairly sure no-one believed me though, if I had a euro for every time I was asked when I last ate or drank something I could probably single-handedly resolve Greece’s fiscal problems. After some inconsiderate soul stole my theatre slot by getting himself shot in the eye, I finally went under general anaesthetic at about 10.30pm. Two and a quarter hours later I was coming round and desperately trying to figure out which of the many fuzzy, white figures was saying “Anna? Anna? Hello, it all went well and you are very lucky”. I later learned that the piece of wood had been about 10cm deep in my leg but had missed all veins and arteries and stopped just 2mm short of my sciatic nerve. Thank goodness I had stayed so still on the hillside. My leg had been opened right up to remove the stump and then meticulously clean the wound. Sterile gauzes were left in my leg and it was bandaged up to such an extent that its circumference would have made Robert Forstemann jealous! Dad and Imo had made themselves comfortable in my ward room and were there to see me when I got back from theatre. We had a hug and said goodbye and I was out for the count before they’d left the building. The next three days were the worst. The bad-boy antibiotics made me very sick; the kind of vomiting where your whole body heaves and you struggle to breathe. I didn’t eat or drink anything for sixty long, nauseous hours, during which the ‘dinner lady’ still wafted greasy, mystery meat-based items under my nose twice daily and looked baffled and offended that I wasn’t tucking in. At this point I would like to thank Rab for making me smile with reminders about the protocol of going for dinner and beers before going to hospital, and ‘what’s brown and sticky’ jokes! Even when it’s ‘triple damn serious’ one can always appreciate a naff joke. Saturday was a bit of a blur, but I do remember waking up to see Imogen’s beautiful but muddy face smiling at me. 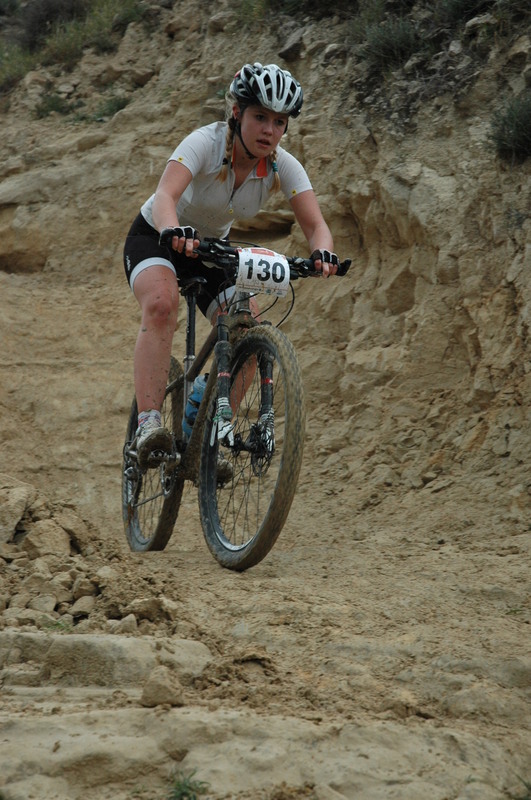 She had raced the first round of the Sunshine Cup that morning and stormed to fourth place, just missing out on the podium in a sprint finish. I failed fairly spectacularly at being her race-support on our first foreign adventure and race of 2013, but I hear that Michiel did a smashing job! I am welling up writing this; I am incredibly proud of Imo racing to such a great result among international riders, especially with the strain of me being in hospital. I know it was stressful for her. She is a star. Looking beyond the fact I managed to fall off onto a stump, I have been lucky with how everything has gone. 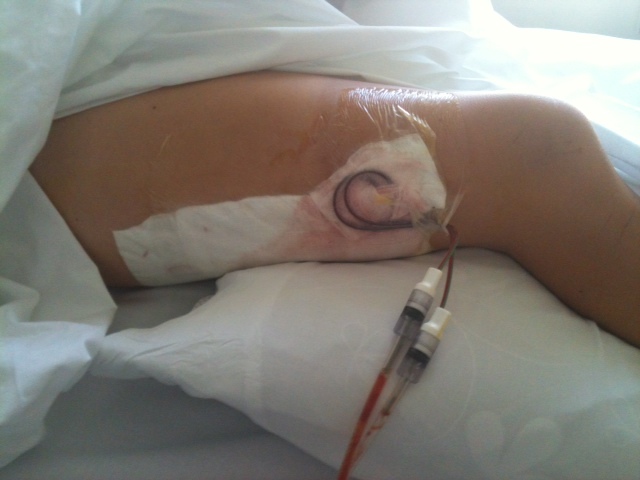 I went for my second operation on Saturday evening. There was no sign of early-onset infection, no bleeding and nothing to stop the surgeon closing up the wound. I was stapled together, had two drains in my leg and was back again in the real world, albeit in an uncharacteristic panic and shaking all over. By Sunday the sun had come out again and my disposition was altogether brighter too. My appetite returned, and it was for chocolate cake! (I text Katy Winton about this – we appreciate cake, and I appreciate her Tight For Life love through the whole ordeal). I had dreamt, twice, about cake – amongst a plethora of other bizarre things including Mum capsizing a beautiful wooden speed boat on the Thames – but chose to try out a nibble or two of biscuit first. Slowly slowly catchy monkey. I also got chatting to my ward-mate, Gabrieliana, who is as melodramatic as her name suggests. She had a remarkable knack of switching between angry and comic hysteria within a few seconds. That said, every Greek dialogue sounds like an argument, so maybe she was always happy. Or always angry. I am really not sure. I shouldn’t complain though because on Monday I had the drainage tubes removed, got out of bed for the first time and took a few steps on my whizzy little zimmer frame, after which she offered me a Kitkat. I accepted. I needed a bloody break! It is tough getting unused and severed muscles to work again. And with that, my chocolate-free Lent diet was over. It was about losing weight rather than for any religious reason anyway, and even if it had been religious I figured that three days without food or drink was penance enough. As was the severe discomfort of the pain-killers wearing off. Unfortunately at the point where I had been up and about for the first time, and was now without a drip, it was the time when the nurses swap shifts, and it took an eternity to get someone in to see me, and then fetch some pain-relief. I hadn’t seen the wound by this point but I quickly became acutely aware that there was a large and very deep cut running down a significant length of my leg! The drugs kicked in and soon after came my daily visit from Dad and Imo. I was particularly pleased about this visit because after five days without a shower I was looking and feeling as rough as a badger’s bottom, and now that I was allowed out of bed I could use the bathroom. The two major lessons learned from my first trip to the bathroom were: a) Imogen is pretty useless at washing someone else’s hair – I got vaguely clean hair and a very wet back, and b) trying to go to the toilet when you can’t sit down or bend one leg is extraordinarily difficult – Imogen held up my bad leg, I balanced on my left bum cheek and essentially just pissed down my leg. Both washing and weeing got easier, but it wasn’t without much hilarity and a fairly significant amount of pain! On Tuesday morning I was awoken, as I had been each morning, at 5.45am by an injection to the stomach. These stung like the proverbial, but I was in a top-notch mood that morning because I was fairly sure I could leave hospital later that day. 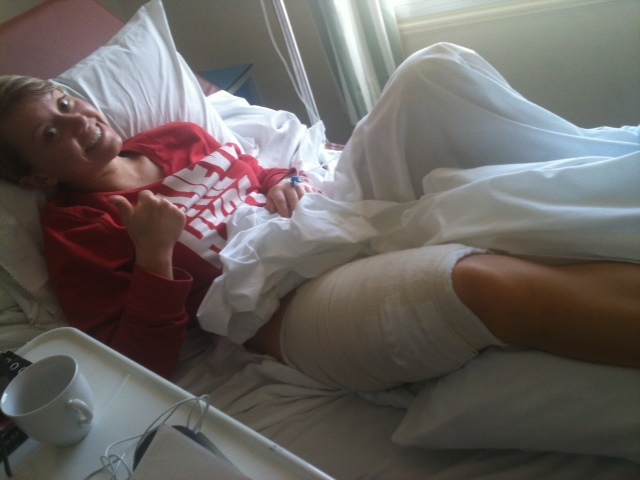 Alas, the surgeon (and his eight or so groupies) changed my dressing and gave me the all clear. I was subsequently visited by the physio and taught how to use my crutches, whereby I nodded along and then promptly discarded the advice in favour of a far more cavalier approach. Soon enough Dad and Immy arrived to take me ‘home’. I was wheeled out of the hospital – not without shooting some unsuspecting outpatients with my crutch guns – and lolopped back into Foxy with the promise to return to the hospital on Friday for a check-up. I fashioned some kind of seat-belt arrangement for the disabled, donned my shades, and we cruised back to Kalavasos on the coast road. Thank you to everyone who text me to keep me company whilst I was in hospital. Rab and Winton, Mum, Charlotte and Milly, Stuart, Chris and the rest. Also to the nurses and surgeons, and obviously thanks to Dad and Imo who made the journey to see me everyday. Big love. 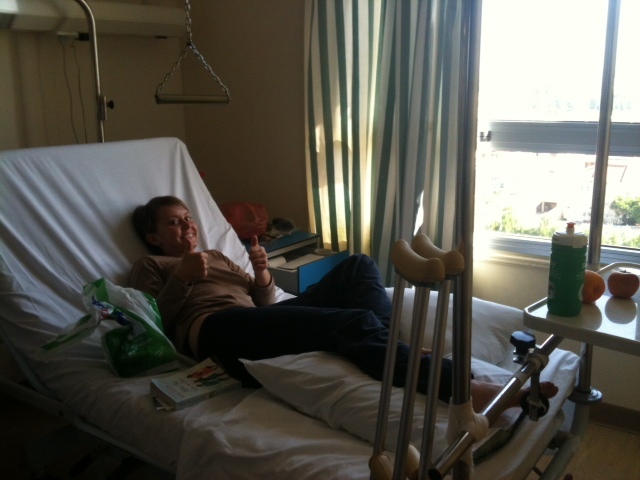 Part three coming up: trying not to crash my crutches and making friends with Marianne Vos. 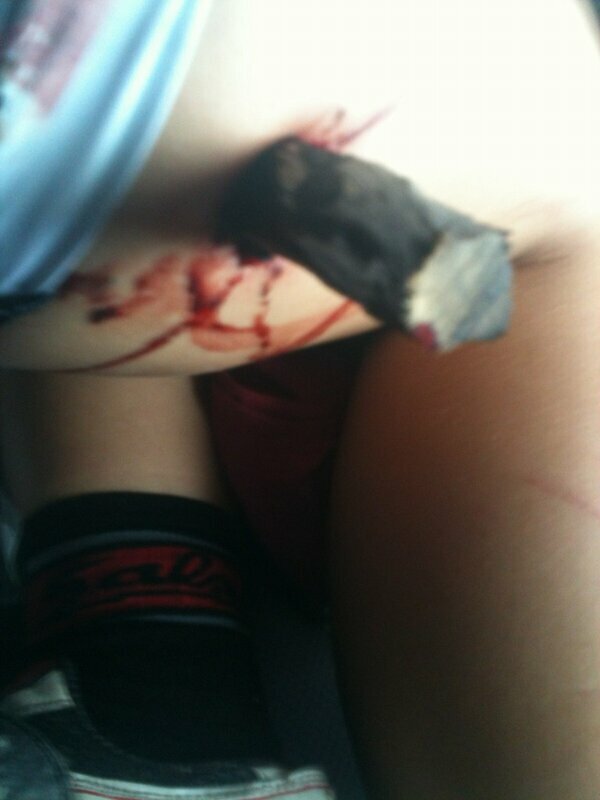 Previous articleCyprus: Sun, Cycling and Stumps, Part 1. Next articleCyprus: Sun, Cycling and Stumps, Part 3. Ps Well done Imo ! I am sure I already replied to this, but it appears not?? Excellent blog, good luck with the recovery. I empathise totally with the toilet situation and bad leg. I busted my leg when I was a kid and had a full length cast on, utter nightmare!!! Thank you. Haha, full length cast sounds totally rubbish!